One of my favorite aspects of Spiral Knights is the ability to create weapons and armor with materials gathered via fighting in the dungeons. It combines the satisfaction of set collection with the gratification of creation from scratch. And it saves on crowns. Especially the higher the star rating of the weapon. Thus, I think most everyone should craft; after all, what else are you going to do with the eleventy-one light shards you’ve just collected? However, unless the tutorial has changed recently, I don’t recall crafting being given much emphasis. Perhaps a passing mention, but I’ve seen new players attempt to buy, from the Haven vendors or other players, pre-made weapons for costs as much as thousands of crowns higher than doing it from the raw recipes. Mind you, there are downsides as well; finding recipes for non-standard items can be a little difficult. But more on that later. A lot of this information is actually available on the Spiral Knights wiki, but I thought I’d include a few more tips and details here. and finally, access to an alchemy machine, freely available throughout towns like Haven. They work like vendors; “attack” them to work them. I like to call them alchemy vending machines. If you’re curious or need a reference, here’s a list of materials. Vatel, in Haven: 1* and 2* recipes. This selection is randomized, and reset every midnight PST/PDT. Basil, in the dungeon Clockworks Terminals, sells 1* to 2* items in Tier 1, 2* to 4* items in Tier 2, and up to 5* items in Tier 3. This selection is randomized, and it’s truly random; you’re not guaranteed to see the same number of recipes or even the highest star items in that tier. Hopefully you’re lucky at least a little of the time. But this is where you’ll find items like the Wolver armor line, or the Troika sword line, or the Alchemer handgun lines. Brinks, in Haven: various weapons and higher-class materials. This selection is always the same, but the price isn’t crowns, but tokens. Tokens are represented by hexagonal icons, and you also pick them up via dungeoning and opening up those treasure boxes. Be glad he’s there, for he makes creating higher-star recipes much easier. Interestingly enough, recipes are initially tradeable objects when first bought from an NPC. Thus, other players can trade recipes with you, and vice versa, at least up until the player chooses to learn a recipe. You’ll need to learn a recipe before you can use it. This process also moves it from your inventory to your recipe box. then select “Learn” from the pop-up menu. You can then access your recipe box by selecting the main menu, and choosing “Recipes”. By clicking on various recipes, you’ll see their requirements and be able to tell if you satisfy the requirements. Once you have the required ingredients on hand, find an alchemy machine and activate it (via “attacking”). This will pop up your recipe box again, but each recipe will now have a Transmute button. Click the “Transmute” button to create the item. You’ve just created from scratch your very own item to use! Important note: if you’re upgrading a weapon or armor (the “special” ingredient in some recipes), you’ll need to unequip it. 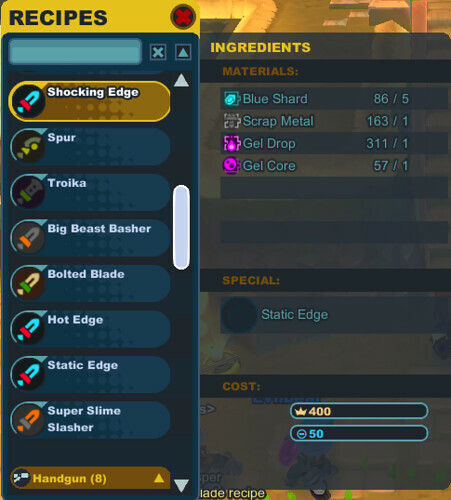 In your inventory, click on the item and select “Unequip” from the pop-up menu. Every once in a while, when you create an item through the alchemy machine, you’ll get a message that a “unique variant” has been created. Mouse over the item in your inventory to view its characteristics; you’ll see a brown/gold box with a special ability. Items with such variants are usually considered more valuable than those without. But remember, when you transmute an item with a unique variant, you have the choice to preserve or discard your current unique variant. This is on by default (the checkbox), but if you choose to discard your unique variant in hopes of getting another, you’re still spinning the roulette wheel! A brand new unique variant on your upgraded weapon in this case isn’t guaranteed. It may take a serious amount of patience to obtain a recipe, given the happenstance nature of finding them. However, it’s usually worth it in the end, unless you’re really quite desperate for one reason or another. The higher-star the item, the better your savings in terms of crowns and energy. Much better to craft, unless you can sell enough crystal energy on the market to afford the more expensive items. See you in the clockworks! And remember, patience is both a virtue and a savings in this game. Thank you sooo much!! It was so hard to get this down, but now i have almost 10k in savings!! you really saved me! KUDOS Thank you very much! but u must put something on the Special to craft it? I was asking around which didn’t have a good feeling plus you where never sure if you would get a correct answer when you asked others about it, I thank you to tell me all about this.